MSCWB Notification is out. 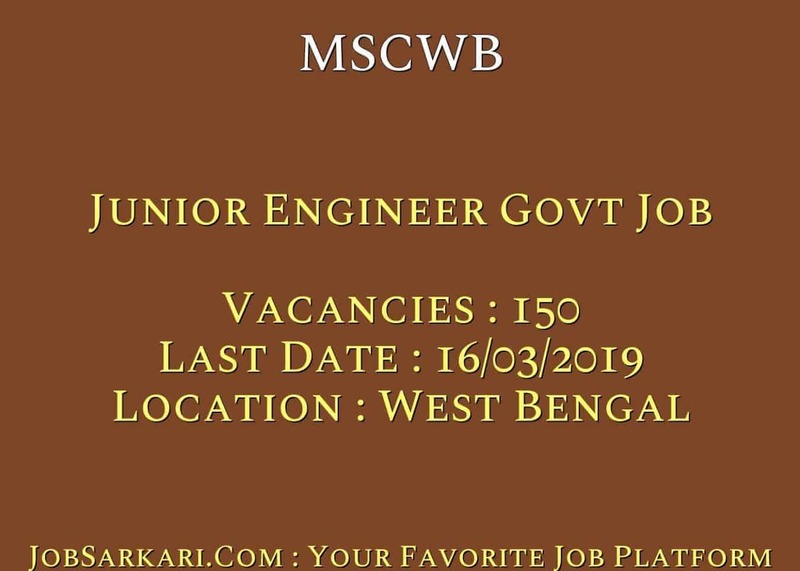 MSCWB is recruiting for 150 Junior Engineer Govt Job Posts. You can check MSCWB - Municipal Service Commission West Bengal last date, download MSCWB notification, visit MSCWB official website and check other MSCWB Vacancy details.Complete Vacancy and recruitment Details about 150 Junior Engineer Govt Job vacancies in MSCWB are provided below by JobSarkari.Com only for you. Last Date of Apply Online. 14/03/2019. Last Date of Pay Application Fee. 15/03/2019. Last Date of Submit Complete Application Form. 16/03/2019. Mode of Payment. Candidate Can Pay Through E Challan At Any Branch of United Bank of India to Account No. 0088010367936. Junior Engineer (Civil) 52 03 10 07 22 06 100. Junior Engineer (Mechanical) 14 02 02 06 01 00 25. Junior Engineer (Electrical) 14 02 02 06 01 00 25. Total No. of Post. 80. 07. 14. 19. 24. 06. 150. Junior Engineer (Civil) Candidate Must Have Passed Diploma in Civil Engineering with Minimum 60% marks or Equivalent Grade with at least 01 Year experience Construction / Supervision / O & M After Obtaining Diploma. Junior Engineer (Mechanical) Candidate Must Have Passed Diploma in Mechanical Engineering with Minimum 60% marks or Equivalent Grade with at least 01 Year experience Construction / Supervision / O & M After Obtaining Diploma. Junior Engineer (Electrical) Candidate Must Have Passed Diploma in Electrical Engineering with Minimum 60% marks or Equivalent Grade with at least 01 Year experience Construction / Supervision / O & M After Obtaining Diploma. Age Relaxation. 3 Years For OBC And 5 Years for SC/ST/PH. 1. On Basis of Personality Test/ Interview. 3. Candidate Need to Fill All The Details And Have to Upload All The Mandatory Documents Like Education Certificate, Caste Certificate And Age Proof As Mentioned in Notification. Q. What is the Last Date For MSCWB Junior Engineer Govt Job Vacancy ? A. 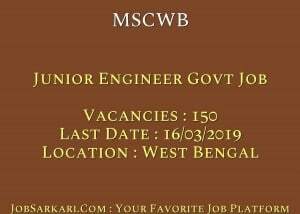 Last Date for MSCWB Junior Engineer Govt Job Posts is 16/03/2019. Q. What is the Form Type of MSCWB Junior Engineer Govt Job Recruitment ? A. The Form Type for MSCWB Junior Engineer Govt Job Posts is Online. Q. How many vacancies are available in Municipal Service Commission West Bengal Junior Engineer Govt Job Posts ? A. There are about 200 Vacancies in Municipal Service Commission West Bengal Junior Engineer Govt Job Posts. Q. What is the Full Form of MSCWB ? A. Full Form of MSCWB is Municipal Service Commission West Bengal .